Brando Sings! That was the main gambit in bringing Bway’s valentine to the screen. The hottest actor on the planet, the guy who just canonized himself with an Oscar for On the Waterfront,, was going to star in a musical—and not just any musical, but one of the most heralded Bway musicals ever; an instant classic. Could he pull it off? Rolling the dice, in the spirit of the show itself, was producer Samuel Goldwyn, who at 73 was winding up a film career as old as the movies. The Polish immigrant had practically invented Hlwd, starting several studios, including Paramount and MGM—which has his name in the title to this day. By 1923 he established himself as an independent one-man studio and in the next four decades he produced over 80 films with his own financing and careful oversight. His métier was prestige drama: The Best Years of Our Lives, Dodsworth, Wuthering Heights., The Little Foxes. But from the dawn of the sound era, he had his hand in musicals, too—mostly featuring Eddie Cantor thru the early ‘30s; then fallow for awhile until he signed up Danny Kaye in the ‘40s. By the ‘50s Goldwyn was slowing down, choosing his projects carefully. As it turned out his final three films were musicals. Hans Christian Andersen was a happy bonanza, and now he was determined to hang on to Frank Loesser, and bring his much-lauded Bway smash to the screen in a production to beat them all. Having spent a record $1 million for the privilege, Goldwyn set about securing a high profile team, beginning with writer/director Joseph L. Mankiewicz, no less an A-list Oscar winner than Oklahoma’s Zinnemann—and just as inexperienced with musicals. But as R&H used Agnes DeMille for insurance, Goldwyn followed suit, hiring Bway choreographer Michael Kidd for his. Also from Bway were set and costume designers, Oliver Smith and Irene Sharaff, tho neither were previously associated with the show. Cinematographer Harry Stradling was blue-chip Hlwd. He would garner no less than 7 Oscar nods for musicals alone, including this one. Casting was a bi-coastal sport. Clark Gable, Burt Lancaster, Robert Mitchum and Kirk Douglas were contenders. Crosby wanted in. Don’t laugh but Goldwyn seriously pushed for Martin & Lewis—but Mankiewicz said no. Post comeback, Sinatra wasn’t about to be left out in the cold. But for which part? He wanted Nathan Detroit. His screen persona had long favored the schlub over the dream-boat (see: Oscar win) but his dulcet tones on Loesser’s tunes would be an indisputable asset. Nathan has one song; Sky Masterson has the show’s great ballads. And if Sinatra was Sky, who would be Nathan? Well, Milton Berle (coming off his TV throne) wouldn’t have been bad. Even better, how about Jackie Gleason? But Sinatra was hot for the part and convinced Goldwyn, against Mank’s better instincts. Sinatra & Brando had the ring of marquee catnip. Betty Grable could’ve been Adelaide, but thankfully wasn’t. Vivian Blaine—who was no stranger to films—had made this her signature role, and along with Stubby Kaye’s Nicely-Nicely were the carryover principals from Bway. For Sarah, first choice was red-hot Grace Kelly, then Deborah Kerr (who would star in a musical soon enuf) before settling for third-place Jean Simmons, who had just worked with Brando in Desiree—and was just as musically virgin. As a writer Mankiewicz was notoriously longwinded (even the brilliance of All about Eve is sullied by garrulous passages on the meaning of “theatah”) He rewrote the entire G&D script to the point where the score was superfluous, before editing to accommodate Loesser—who was also quite involved in the filmmaking. But ultimately it was Goldwyn’s movie. Who in his right mind cuts the most popular song from a show? Goldwyn, that’s who. He didn’t like “A Bushel and a Peck.” As it happened, the ditty (which sprung from a rhyme Loesser read in Truman Capote’s Other Voices, Other Rooms, and was written beforehand) was the biggest pop tune from the musical. Hit recordings were made by Perry Como & Betty Hutton, Margaret Whiting & Johnny Wakely; Johnny Desmond; Doris Day and The Andrew Sisters. But Sam didn’t give a damn and tapped Loesser for a replacement. He also wanted the film to have its own hit ballad, and Loesser complied with a nice-enough song in “A Woman in Love,” but was it really an improvement over “I’ve Never Been in Love Before”? On the other hand, Loesser’s third addition, a song for Nathan after the forced announcement of his wedding, “Adelaide” was a smart move, an actual enhancement to the character and story—as well as giving Sinatra some extra vocal presence. Frank was also front & center in the title song and “The Oldest Established,” neither of which Nathan sang on Bway. He’s weakest, in fact, in Detroit’s one stage song: “Sue Me,” giving credence to his being somewhat wrong for the part. Reportedly Loesser grew furious with Frank and never spoke to him after the movie. 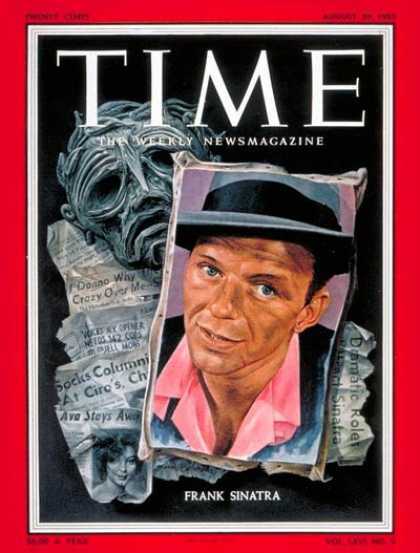 Yet Sinatra recorded much of the score for an all-star Reprise record years later, putting his definitive stamp on “Luck Be a Lady” (still playing in any number of Vegas casinos this very moment) and a peerless “I’ve Never Been in Love Before.” Compile the various recordings and Sinatra emerges as the consummate interpreter of Loesser’s score. But you don’t really remember the movie as one of his greatest moments. And what of Goldwyn’s biggest gamble? Well, Brando manages to pull it off. He’s “surprisingly” competent, and brings some intensity to his scenes with Simmons. He’s got gravitas; and even a sense of humor but there’s no lightness in his performance. It’s more like a challenge met; an exercise in stretching range; a why-not vacation from drama—and not what the movie really needs, which is Gene Kelly. Goldwyn wanted Kelly initially, but MGM would not release him (tho ironically, they ended up distributing the film). Brando brought prestige and curiosity to the project, and no doubt a good deal to the gross; but at the cost of the show’s musical delirium. Jean Simmons was similarly challenged, and like Brando, studied and sang her own songs; charmingly if not exquisitely. But she embodies the role and character so beautifully I can’t imagine anyone doing it better. To be honest I can’t say the same for Vivian Blaine, sacrilege tho it may be to besmirch her patented role. I’m surprised by how unmoved I am by her rendition of “Adelaide’s Lament,” one of musical comedy’s greatest comic soliloquies. She has neither Star Quality (like Judy Holliday might have infused in the role) nor a fascinating quirkiness (that someone like Geraldine Page would bring); she’s a little bland and there’s a regrettable lack of subtlety in her performance. Personally, I much prefer her in R&H’s State Fair, where she is real as well as endearing. The other Bway veteran, Stubby Kaye is perfection as Nicely-Nicely. The way he beams and blushes in the final scene—having converted to a life and likely new wife in the Salvation Army—is so unexplainably sweet it makes me smile just to remember it. There’s a few more Bway imports, but all these thugs and gamblers are right out of Central Casting and not truly memorable. Mankiewicz gave Kidd full supervision over the musical numbers; which is great for the songs, but at odds with the movie. Or at least Mank’s literate & loquacious style of realism. Kidd was working off the snappy tone set on Bway by Abe Burrows and George Kaufman. His choreography, coming so quickly on the heels of DeMille’s folkloric ballets—but even compared with almost anything we’ve seen so far--was pointedly “eccentric.” Not quirky, like Fosse, but downright cartoonish—a human circus with bodies bent to postures you’d have thought only possible in animation. So much of it reminds me of Li’l Abner (which of course Kidd would do later)—the same comic lowlifes with their shifty shuffles and exaggerated thrusts; the women all curves and attitude. Vibrant for sure, but somewhat jarring springing out of Mank’s long, and sometimes lugubrious scenes. On its own, the dancing is dynamic, starting the film off with a Times Square roundelay; denizens of Bway (nary an ethnic face among them) defining character thru dance; following a chain of events showing local color as well as guiding us thru the soundstage Rialto set—essentially a series of storefronts. (About that set: what’s amazing here is how deliberately generic it is, names and logos altered to avoid any positive I.D.—the very opposite of today’s product placement opportunism—or any semblance of reality.) The sets would often be cited later for the film’s aesthetic failure. But I don’t mind them, at least until they fade off into the distance, where Times Square seems to sketch itself out, moving beyond cartoon to a visual deconstruction of the very idea of scenery. Too bad they didn’t film on location for those few scenes with long views, but then the real signage would cheapen the fake nameless sets even further. The opening ballet segues into “Fugue for Tinhorns,” but listen closely to the transition; one rhythm playing off the “Runyonland” sequence, while a different beat layers in the racetrack bugle call, before a third settles into a vamp—and the round begins, “I’ve got the horse right here…” It’s a terrific arrangement, and one I’ve not heard elsewhere. But the film’s orchestrations are just OK and nowhere as brilliant as they were in Oklahoma! Underscoring in musicals is rarely noted, much less discussed, but when thoughtfully applied it’s a real enhancement. There’s a real deficiency of underscoring here, and the film really suffers for it. Dare I say it may be the film’s most fatal flaw. Music sets a tone and picks up the pace. So many dry scenes would be lifted with a melodic line—especially the comic ones—and remind us this is a musical. What underscoring there is seems rather haphazard. Why, for instance, in the dressing room when Adelaide begs Nathan to marry her (again), is the orchestra playing “I’ve Never Been in Love Before?” Yes, I know the lyrics aren’t heard, but the melody nowhere suits the scene’s mood either. On the other hand, the entire Havana sequence is underscored with “A Woman in Love” in various Latin beats—which makes it seem familiar when Brando introduces it later in the story; and proves my point about generous use. Mankiewicz went a bit overboard here, greatly expanding the trip to Cuba, adding some sightseeing, dinner and drinks; a wild dance and then a brawl. This last (not seen on Bway) is positively ludicrous, a drunk Simmons slugging men and women with a right hook and coming out of the melee untouched. And it goes on and on. For sure the Havana sequence doesn’t hold back; a seedy mambo that has Brando doing the light fantastic with a Cuban spitfire so fiery she practically makes the screen sweat. This literally smoking-hot crimson-clad babe (precursor to Appassionata von Climax & Stupefying Jones) has a drooling piece of slime trailing behind her in worship. Simmons later grabs him in challenge to Brando, and for a few moments the dance floor heats up in Latin passion. Only to end in that ridiculous brawl. Liquor and adrenalin pumping her veins, Sarah has her giddy way with the other pop hit, “If I Were a Bell"—a perfect song for the spot, and yet one I’ve never been able to get excited about. Aside from the aforementioned excisions, the score is mostly intact. 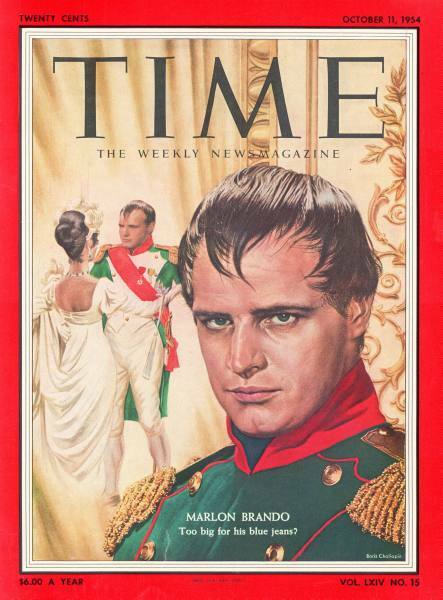 “My Time of Day” is used under the spoken lead-in to Brando singing “A Woman in Love,” and “More I Cannot Wish You,” (a sappy Irish ballad) is thankfully absent. But one song is sorely missed for its single interaction between Sarah & Adelaide; “Marry the Man Today”—a song as pivotal as it was deemed extraneous coming at nearly 2½ hours into the running time. It’s the pace that sours the film--taking the entire length of most musicals to get to the end of the show’s first act. But there’s no intermission here. Goldwyn didn’t follow the R&H manner into reserved seats and Roadshow engagements, tho he beat their epic length by four minutes. The show has been endlessly revived to this day—several times on Bway and London and in every imaginable level of amateur and professional production. So it’s somewhat surprising there hasn’t been another film of this classic; whether a late ‘60s ABC special (with Carol Lawrence & Robert Goulet) or a Zadan/Meron production today (Matthew Morrison, no doubt, with Kristin Chenoweth as Adelaide?). 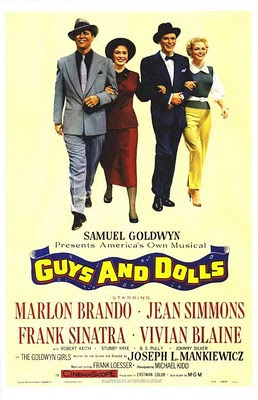 With the likes of Brando, Sinatra, Jerry Orbach, Walter Matthau, Robert Guilluame, Peter Gallagher, Ewan McGregor, Bob Hoskins, Nathan Lane & Oliver Platt as G&D alumnae, there’s an undying “cool” factor in playing these Runyon “heroes.” But sixty years after the fact, Goldwyn’s film still stands alone as the show’s digital representative. It was only #7 on the list—the list I had just begun at New Years when I was 14; and the only one I’ve resolutely kept up for 43 years yet; my movie list. It was February 8, 1967, and to this day I can still remember sitting in my junior high homeroom class that Wednesday morning simmering with anticipation for the network TV debut of Guys & Dolls that evening. By then I’d gone mad for musicals; collecting dozens of Bway albums, devouring all the library books I could find on Bway history, and catching every movie I could find on TV or, if lucky, on the screen. The Golden Age was only then just winding down, but the crop of recent classics was bumper—and among the cream of the crop, Guys & Dolls was said by one and all to be a benchmark. With its Times Square milieu and Frank Loesser score how could it not be up my alley? From everything I’d heard and read this was sure to be one of my favorite musicals ever. But then it wasn’t. And it’s been a puzzlement ever since why I’ve never truly, deeply, madly, fallen in love with the show. Sometimes the first impression is the one that lasts; and with Guys & Dolls that first impression for me was Goldwyn’s heavy hand. It hasn’t lightened with age. Casting: More publicity stunt than perfection. Titles: Letters over abstract Times Sq b.g. Oscar Noms: 4, no wins. I hate to say this, but I mostly agree with you. I was so surprised by Jean Simmon's wonderful performance. Her singing voice would have never lasted on stage, but for the film it worked quite well. I too was appalled at the omission of three great Loesser songs. 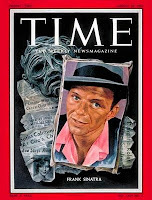 I absolutely HATED Frank Sinatra in the role of Nathan Detroit, but agree that the ADELAIDE song adds much to the character and should be inserted into the stage productions. I actually think Faith Prince was the best Adelaide, but I would have liked to have seen Blaine do it on stage to compare. Don't get me started about the sets...UGH! I never thought about the underscoring until I read your comment and watched the movie again. I guess you are right again, but lets see what the future holds.